19th-century red velvet with silver clasps. Purchased with the generous assistance of Alice Tully in memory of Dr. Edward Graeffe, 1970. Purchased by H.P. Kraus from a private collector in Milan in 1949; sold by Kraus to Martin Bodmer, Geneva-Cologny; re-purchased by H.P. Kraus from Bodmer ca. 1968; purchased from Kraus with the generous assistance of Miss Alice Tully in memory of Dr. Edward Graeffe in 1970. Ms. prayer book; written and illuminated in Milan, Italy, about 1430. Collation: I4, II8, III9, IV8, V9, VI7, VII9, VIII6, IX5, X4, XI7, XII8, XIII8, XIV3. The manuscript is written in dark brown ink by one scribe. The text comprises 47 prayers arranged liturgically and dedicated to various feasts taken from the Temporal and Sanctoral cycles of the church year. Decoration: 22 full-page miniatures with floral borders, 1 historiated initial, 47 text pages with borders, 46 illuminated initials; at least half of the original miniatures and parts of the texts are missing. Artist: Michelino (de' Molinari) da Besozzo. Michelino's contemporaries regarded him as the "supreme painter" and the "most excellent of all the painters in the world." 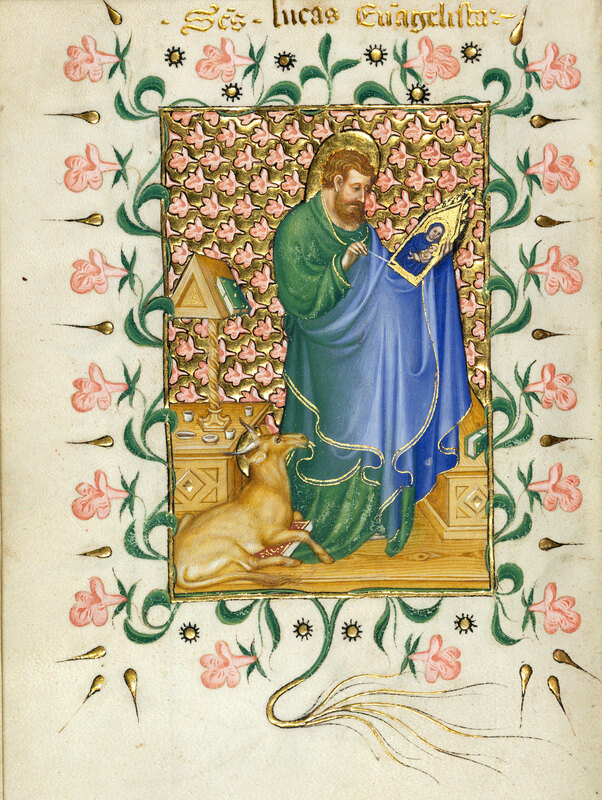 This small prayer book, which contains most of his surviving work, is his masterpiece. Here St. Luke the evangelist is putting the finishing touches on a small panel of the Virgin and Child. This is one of the earliest Western depictions of the subject, which became increasingly popular later in the century because St. Luke was the patron saint of painters and painters' guilds.